The Tran-Siberian Railway is the ultimate rail journey, the longest in the world, possibly the coldest if you go at the wrong time of year, and the only rail journey that travels across two continents on a single trip, all while staying in the same country. Without leaving your seat you can clatter along almost a third of the globe; the Trans-Siberian is an excursion of almost mythical proportions. There are three routes that travellers can take to explore the expanse that is Siberia: The 6,000-mile-long Moscow-to-Vladivostok route, and two others that leave Moscow heading toward Beijing: one going through Mongolia, taking six days and travelling almost 5,000 miles, and one that runs via Manchuria, which takes almost a week to complete. I was intrigued by the country that was once the home of Genghis Kahn. 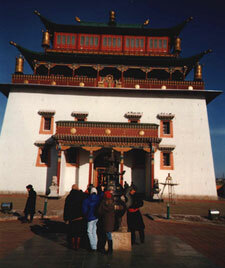 I knew almost nothing else of Mongolia, and that only added to my interest. My journey started on a Tuesday night at Yaroslav Station in Moscow. Platform 3 was packed with traders loading the train with rugs, stereos, clothes, underwear, and a host of other goods that I assumed were going to be sold on the way. I expected to see many world-wise travellers in the station, waiting to take this epic journey, but there were none. And it seemed I was the only person who had not brought at least half a carriage worth of goods to peddle. I pushed my way past bags, of what smelled like horse blankets, to find my carriage. The compartment was about as big as the bathroom at the Moscow hotel. There were roughly eight compartments to a carriage. Each compartment consisted of a small table next to the window and two beds on either side, with another two beds suspended from the sides of the carriage, but stowed in an upright position to give the illusion of space. There was no one else in my carriage as I went through the ritual of removing my hat, gloves, coat, and the several other layers I was wearing to keep out the Russian winter. 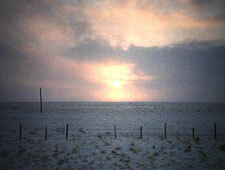 It was early January, and the outside temperature was below -20º. I went into the corridor and looked out the window at the remaining passengers loading their wares. Until I reached Ulan Bator in five days time, this was going to be the way I would see the world. Travelling by train can be unique that way: the cultural experiences often come from inside the cars, and train travellers often have the most interesting stories to tell. Suddenly, I was torn from my thoughts as several people walked into the compartment behind me. Confusion started as seven of us tried to lay claim to the four beds in the compartment. There had been an obvious case of overbooking and we chatted politely as we waited for the ticket collector to see who would be thrown off the train. Luckily no one was turned away, and three of us were moved to other carriages. I went to first class: still with a toilet at the end of the carriage and no shower, but the compartment had only two beds, and for the moment I had it to myself. Not bad for a $200 ticket. I spent the evening alone in my compartment, sipping strong Russian tea from the samovar at the end of the carriage. 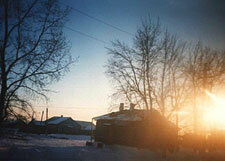 The high-rise flats of Moscow turned into countryside dotted with small towns. Russian Orthodox churches appeared in almost every town we passed through, lit up against the surrounding hills that were covered in snow. Yet there was barely enough time to appreciate this beauty before it passed by and another view filled the window frame. This was how much of the journey was taken up: looking out the window admiring the scenery. Every morning I would open my curtains wondering what new view would greet me as the train moved through the Urals into snow-covered forest to the Russian steppe and the large expanses of nothingness. It was hard to get bored of the scene and the anticipation of another beautiful sunset, knowing that you’d travelled almost a thousand miles and another time zone since the previous night. 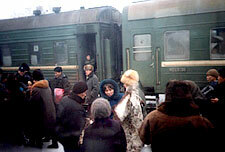 The Trans-Siberian makes frequent stops to pick up new passengers and let others alight. Yekaterinburg, Omsk, Novosibirsk, Irkutsk, and Ulan Ude, near Lake Baikal, are just some of the great cities the train passes through. However, stopping for only an hour so at a time, there is little opportunity to sightsee except at the stations. If you miss the train leaving, it can be a week before another will take you to Mongolia to catch up with your luggage. I chose to stay close to the train, observing (and often avoiding) the hustle that met us at stations where traders sold their goods. Old women often came up to the doors of the train offering hot meals of chicken and vegetables or meat and potatoes, as well as soup and biscuits. A three-course meal could be enjoyed from your window if you didn’t want to visit the dining cart that day. Other people would approach with crafts such as decorated glass and crystal, paintings, fur hats, or other specialties of the region. Many workers in the local factories were paid part of their wages in the products they produced; selling these items to the train passengers was a good source of income in the struggling economy. I often swapped some of my own possessions for snacks: a pair of warm socks got me a huge bag of berries that I enjoyed for the rest of the journey; my book, 2001: A Space Odyssey, got me a new pair of gloves. At the end of the first day someone joined me in the compartment. Elenor was a young woman from Perm who was on her way to visit her sick mother in Ulan Ude. Her English was as broken as my Russian, but we got along well. We spent the day talking about her children and what I was doing in Russia. She would often tell me how I reminded her of her ten-year-old son and when I fell asleep on my bed she draped her shawl on me and gently sang Russian songs. Elenor had a supply of shopping bags that she was selling at stations to pay for her journey. As the train pulled into another stop we would both lean out of the windows waving the colorful plastic bags and yelling “Sumki, Sumki!”–Bags, bags! I never sold many, but then, neither did Elenor. Visitors would often pop into our compartment to chat, bringing gifts of vodka or chocolate. While I only understood part of the conversation, the talks were always animated and very enjoyable. Moving between carriages to meet other travellers, I would take along my bag of berries as a guest offering. I was keen to experience Russian cuisine and eat the food I found in the stations or the restaurant car; I’d often trade packs of dehydrated meals that I had brought along just in case. It was a continual source of amusement as we poured hot water into the foil packs, and a full meal was ready in minutes. Before leaving the U.K., I was worried that my Russian would not be strong enough to help me mix with local travellers. My language was bad, but I was warmly welcomed anywhere I went on the train. I never met another Westerner, and I can’t say that I minded. The days passed too quickly, and the boredom I once feared never set in. I was hoping to finish my second book and swap it for something at the last station, but I could hardly read a page before my eyes would drift toward the window and I’d became lost in what lay outside. 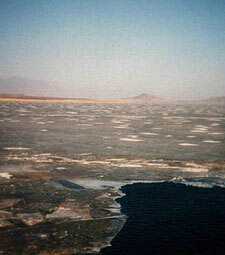 I had been waiting eagerly to see Lake Baikal, the deepest lake in the world, and Elenor woke me as we passed it. This huge body of water was covered in ice and stretched to the mountains on the horizon, but it disappeared within minutes as the train turned a corner and we headed back into the forest. We soon arrived at the station in Ulan Ude; this was Elenor’s stop. We said our goodbyes and she left me one of her shopping bags to remember her by. I promised to write but after she’d gone I realized I never took her address. Sara, “the only female doctor in Mongolia” (or so she told me) now occupied the other bed in my compartment. A gentleman from near Lake Baikal, Valery, also joined us for the brief remainder of the trip. He talked passionately about the lake and how “you can catch fish with just your arms.” He also brought food from the region: caviar, black bread, cured fish, biscuits, and other delights that we tucked into eagerly. The three of us shared stories and exchanged English and Russian lessons until we reached the Mongolian border late that evening. The border crossing took almost six hours; we ate and drank numerous bottles of vodka. 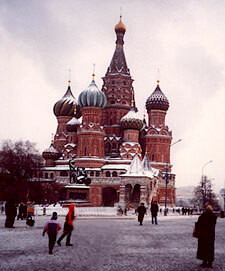 The border guards were cheery and shared the vodka as they checked our passports. They chatted to us in three languages: English, if they were talking to me; Russian, when they talked to Valery; and Mongolian at all other times. I thought I understood perfectly, but maybe that was just the vodka. The last night on the train passed quickly, and I slept until we reached Ulan Bator–the capital of Mongolia–the next morning. I was hoping to enjoy a last breakfast in the restaurant car and get the chance to say goodbye to many of the people I had met during the journey, but as we got into the station there was just enough time to gather my belongings before being ushered off the train. While the trans-Mongolian route of the railway continued for 1,000 miles to Beijing I would not join it for another four days. In that time I would have the chance to look around the capital city, then hop on another train for just one more day, completing one of the longest rail journeys on the planet when I arrived in Beijing.